I was away on a course on Thursday and Friday and stayed overnight at the Carrick Lodge Hotel . I can highly recommend it, both my room and my colleague's room were of a high standard and the food was excellent. I hadn't taken my camera so can't share my meal with you. However, on the menu at breakfast there was 'Eggs Benedict', not something I would normally choose, but I just couldn't resist. It was my Dad's favourite and is now one of my favourites too. So, where is all this leading? I have never made Hollandaise sauce and after my Eggs Benedict, I thought it was probably about time I had a go. I know it has a reputation as being tricky but the recipe looked simple and I had everything I needed to make it. 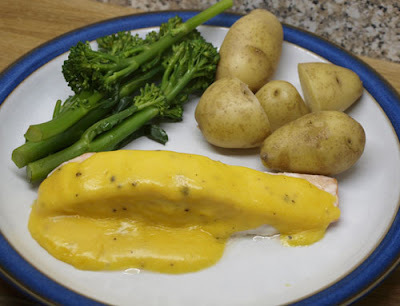 We were having salmon fillets for dinner and some sauce would lift them to a real treat. I could have chosen a recipe from any number of my collection of cookbooks but decided to have a look and see if Rachel Allen had one - and she did! Right there at the back of Home Cooking in a chapter entitled Basics. 1. Place a heatproof bowl over a saucepan of simmering water on a medium heat. Add the egg yolks and 1 tablespoon of cold water and whisk together. Gradually add the butter, bit by bit until each addition has melted and emulsified as it is whisked in, before adding the next. 2. 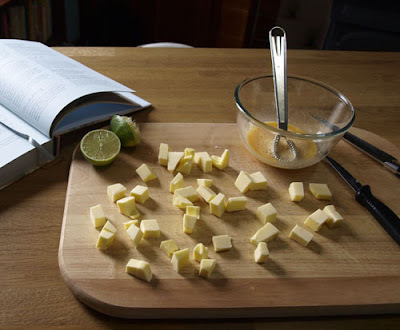 Once all the butter has been added, cook for a few minutes more, stirring regularly until the sauce has thickened enough to coat the back of a spoon. Taste and season with salt, pepper and lemon juice. 3. Remove from the heat and keep warm if necessary, by covering with clingfilm and leaving to sit over the warm water, until you're ready to serve. Confession No. 1: The sauce made perfectly, until I put in the lemon juice and then the d**n thing split! So on the basis that it is just hot mayonnaise, I got another egg yolk and a clean bowl and gradually whisked the split sauce into the egg yolk over the simmering water. It worked a treat! Confession No. 2: I served this to Mr Farmer, he tasted it and said what a nice CHEESE sauce it was, I don't know why I bother sometimes - ha ha ha! It does seem easy enough ~ great correction after adding the lemon juice. I wonder why that happened? I love Eggs Benedict and like you it lead me to making Hallandaise. I've made it quite a few times now but still sometimes it can go wrong splitting etc .. as you know! I think if it has tarragon in it, it is Bernaise sauce - would that be right? I have only ever tried it once and the lemon juice splitting happened with mine too. I think I'll try again now you've mentioned about saving it. I just made some Hollandaise for the first time myself! I had heard it was tricky too but I'm so glad I tried it. Mine got too warm and looked like melted butter. After a cooling down, all was well though! Your sauce looks so lovely and yellow. 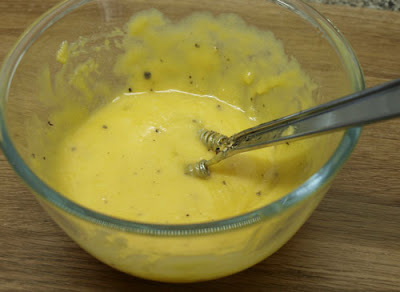 I've never made Hollandaise either, but I keep thinking I ought to cos I do like it. Must follow your lead. 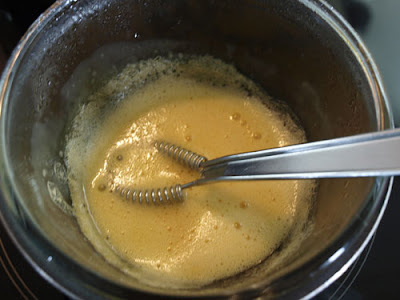 The first tiime I made hollandaise it was perfect and I wondered what all the fuss was about. The next time I made it in exactly the same way and it was a complete disaster - at least now I know what to do! We are totally wasted on our men sometimes!